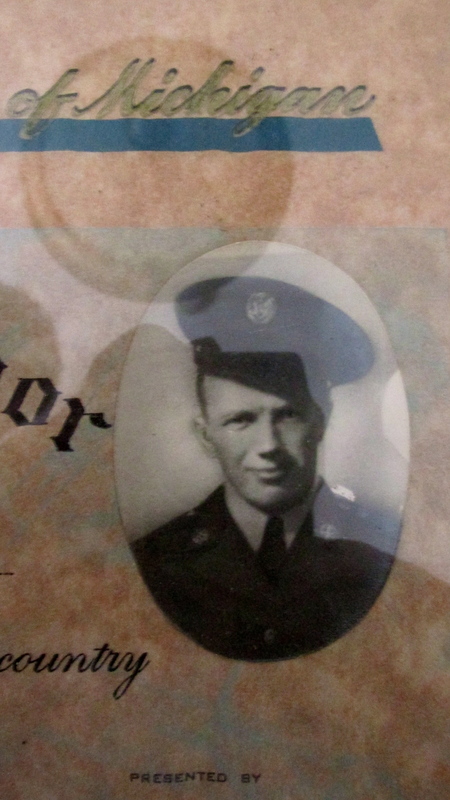 George Eyster started off driving a 2 1/2 ton army truck in the 254th Engineering Battalion attached to Gen. Omar Bradley’s 1st Army when it came ashore on Omaha Beach June 6, 1944. He saw the war from the vantage-point of a deuce-and-a-half starting with the invasion beach to the Battle of the Bulge, on to the Remagen Bridge rebuilding along the Rhine and finally into Germany on V-E Day at Leipzig. 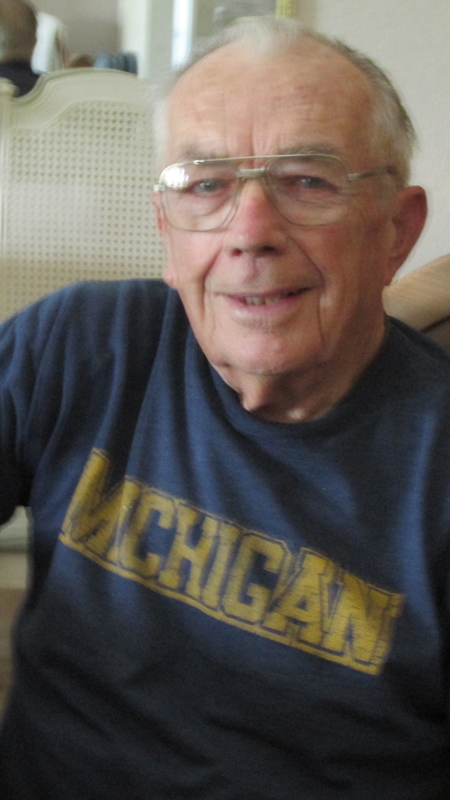 As a teenager in the late 1930s, Eyster joined the Civilian Conservation Corps. It put young men to work preserving the country’s natural resources during the worse of the Depression. For most of his 18 months in the corps he planted trees in the Upper Peninsula of Michigan. He did until shortly after joining the National Guard. After the Japanese attacked Pearl Harbor, almost immediately President Franklin Roosevelt nationalized the guard. Eyster, like millions of other youths, found themselves in the armed forces of the United States for the duration. He went from field training near Alexandria, La. to Fort Dix, N.J. after the surprise attack and from there his unit, the 254th Engineering Battalion from Michigan, was sent to Europe. At a resort area along England’s extreme south shore his battalion built an invasion beach identical to the Normandy beachhead where Allied forces would land in France. The German got wind of the pending landing at Slapton Sands, the tourist area, where the 254th replicated Normandy. “Exercise Tiger” is what the mock invasion was called. It was to take place on April 28, 1944–a little more than a month before the actual beach assault on the continent. Just off the coast of Devon, England aboard LSTs (Landing Ships) were 30,000 U.S. troop when they were attacked early in the morning by nine German E-Boats (Steel-hulled torpedo boats). In a matter of minutes three LSTs were badly damaged, several were on fire and one sank. In the glare of the morning light 749 U.S. servicemen were killed. Because the D-Day Invasion was imminent Gen. Dwight Eisenhower, Supreme Allied Commander, and Prime Minister Winston Churchill covered up the E-Boat disaster. They were concerned it might have an ill affect on the pending invasion. All survivors were sworn to secrecy on penalty of prison. The dead were buried in a mass grave along the beach at Devon and their relatives received official telegrams saying their sons had been killed during the Normandy Invasion of Europe. The general public didn’t learn the truth for more than half a century when the English press divulged the tale. “I didn’t know anything about the E-Boat attack on our troops,” Eyster said. Six weeks later he and the other members of the 254th Engineering Battalion went ashore at Omaha Beach after assault troops cleared the way. “The worst thing about the landing was making the beach in my truck. I was submerged in saltwater up to my chest when we dropped off the landing craft’s steel ramp,” he said. “Our guys had already taken the German fortifications along the beach and pushed them back a ways. The first day we ended up at Hill 97 near St. Lo. The Battle of the Bulge was possibly the 254th Battalion’s finest hour. This is where the Germans broke through the Ardennes with their tanks and heavy armor on Dec. 16, 1944. Eyster says he wasn’t on the front lines. He was taking care of his Jeep further back from the fighting. By this time he was a “Liaison Driver” for his engineering battalion. He and a lieutenant ran messages back and forth in the Jeep when a front line division requested a bridge be constructed or a mine field cleared during an advance. It was his unit that built “The Victory Bridge” across the Rhine River at Remagen, Germany after the original bridge collapsed under the stress of tanks, heavy equipment and continual shelling and bombings by the retreating Germans. After the old bridge collapsed of its on volition, the 254th Battalion built a pontoon bridge across the historic Rhine River into the heart of the Fatherland. The curtain was falling on Hitler’s Third Reich. “We were in Leipzig when V-E Day (Victory in Europe) was announced, May 8, 1945. Two months later I was discharged at Fort Sheridan, Ill., outside Chicago, on July 15. His wife, Ann, says she and George have been married 68 years. They moved to Port Charlotte in 2000. The couple has six children: George, Kathy, Gary, Gregory, Jeffery and Guy. Commendations: Distinguished Uni Citation, Eurpean, African, Middle Eastern Theater Ribbon with one Silver Battle Star, 6 Overseas Service Bars, American Defense Service Ribbon, Good Conduct Medal. Battles/Campaigns: Battle of the Bulge, Crossing Rhine River at Remagen, Germany. This story was first published in the Charlotte Sun newspaper, Port Charlotte, Fla. on Monday, Sept. 29, 2014 and is republished with permission. The look on his face as he remembers the events in the shadow box tells a story in itself. Bravery, fear and camaraderie. Hello,,,Thank you for your service..My DaD served 38 months in the 95th Infantry Division,,and was also there…Battle Bulge, Metz,,Omaha and Utah beach and also said that they FROZE their asses off as they were NEVER issued winter fatigues and ALL they had were the summer clothes that they were wearing..He was truly blessed and after the war lived until he passed away in 2009 at the grand old age of 93…I think of him daily and NO WORDS can tell anyone how much I MISS MY HERO,,,,My DaD,,,,Carl Szabo……May GOD BLESS YOU my friend and ALL that have served and who are now serving this GREAT country of ours…. My dad, Mike Fornetti from Iron Mountain MI was in the 254th and I have a photo of him standing by Victory Bridge.